As a follow up to a legendary Toronto real estate “bidding war for the record books” story, remember the dilapidated home in Roncesvalles that was up for sale a few months ago? The listing included the phrase “not for the faint of heart”? 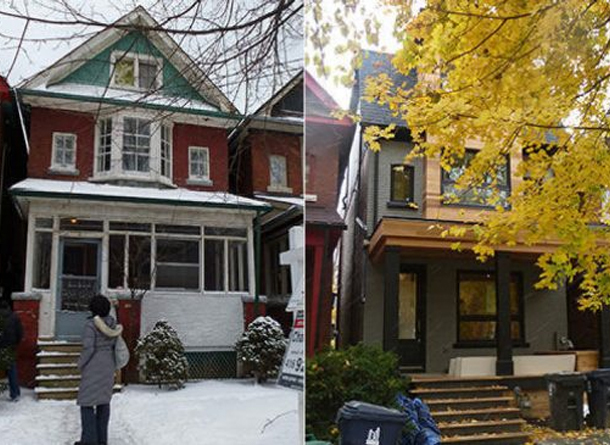 The Star’s Susan Pigg has written an interesting piece on this home and on Toronto’s aging housing supply, especially on what’s happening with the extensive renovations and how that’s affecting housing prices. If you’ve been in north Toronto, you’ve seen what’s happening with the old wartime bungalows. They’re being knocked down and being replaced by enormous homes that are completely at odds with the neighbourhood and the size of the lot. One real estate consultant believes that the City of Toronto’s building approval process needs to be revamped – he suggests that it would be better to build two semi-detached homes on the property rather than one enormous home.